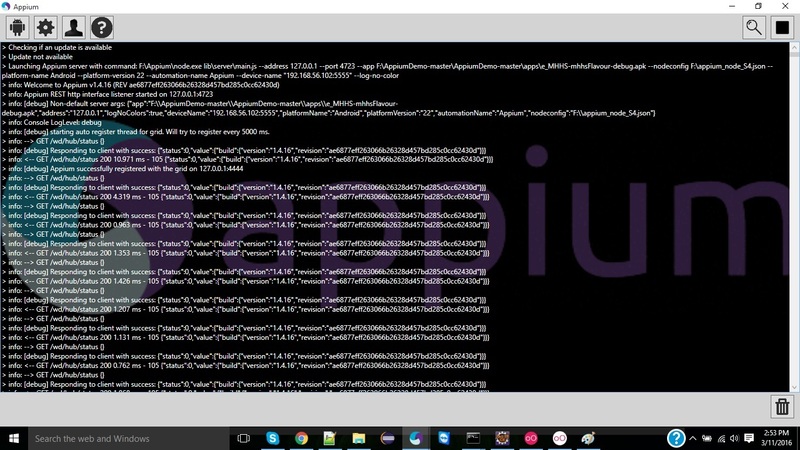 When I execute test for any device, always script runs in one appium server which is started firstly i.e. node1. you are trying to select the node with deviceName, but the hub does not use this capability. The hub only reads browserName, version, platform and applicationName. The other capabilities (deviceName, platformVersion, platformName, …) are Appium capabilities, not used by the hub. 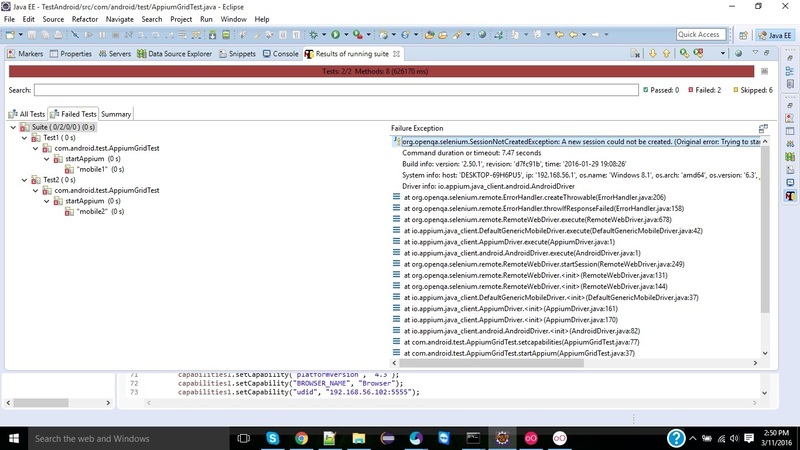 I can see there are some success using appium grid over Selenium but is there one person that managed to do this using windows (without emulator!) simply** two Android devices**? I’m trying to have some mobile automated tests running with appium and selenium grid. Once i done all configuration stuff and added grid nodes, how do i run my tests parallely in both devices? What it supposed to be in deviceName in this case? I only can run the first node registered in grid. In this case http://127.0.0.1:4723. How to start mobile automated tests using selenium grid in python? Have you found a solution to run parallel tests with python? I have started working on running parallel android devices by using grid.My Problem is the app installed and opened both connected devices properly.but it has not typed any values which i have given. After that it shows error message in setup method. Can anyone help me for this issue??? I have been facing some issues in Appium Grid. The hub has connected to the node properly.I have connected two devices for testing.The App has installed both devices and then stopped working.Herewith I have attached the code for reference.Please Specify me where the problem is. Do you have any error message? Can you provide appium logs? I am getting the below issue in appium grid. could u pls help me with it. I have started two appium server simultaneously. both appium servers run as above image. I have been waiting for your reply… Is there any solution for this issue. 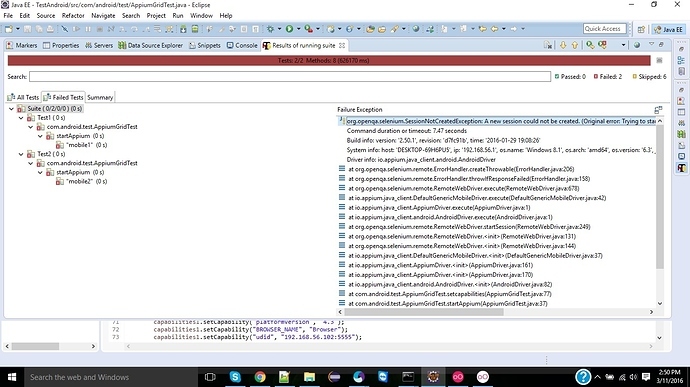 It’s not possible to help you with partial screenshots, you must provide complete appium logs. And before pasting them, please read them carefully, trying to find out at least the error message. This will help you to find out the problem and to learn more about how Appium works. I have everything set up however once I run the jar file , it picks up the device but then just hangs on executing the appium and nothing happens with the phone. Any help will do. Also when importing this into eclipse and trying to run it from the source it throws java.io.IOException: Cannot run program “adb”: error=2, No such file or directory.